Preheat the oven to 160°C and set aside one 25cm standard bundt cake tin or two 18cm small bundt cake tins. Sift the flour, baking powder, sugar and salt into a large bowl. Add the oil, egg yolks, lemon zest and juice and mix until smooth using an electric beater. In a separate bowl, beat the egg whites, using an electric beater, until soft peaks form. Add the cream of tartar and beat until stiff peaks form. Gently fold the cake mixture into the egg whites until well combined. Pour the mixture into the ungreased bundt tin or tins and bake, 1 hour for 1 large cake, 30 – 40 minutes if you are making 2 small cakes. To test the readiness, a metal skewer inserted close to the centre of the cake or cakes should come out clean. Remove the cake or cakes from the oven, turn upside down over a cooling rack and set aside to cool completely in the tin. 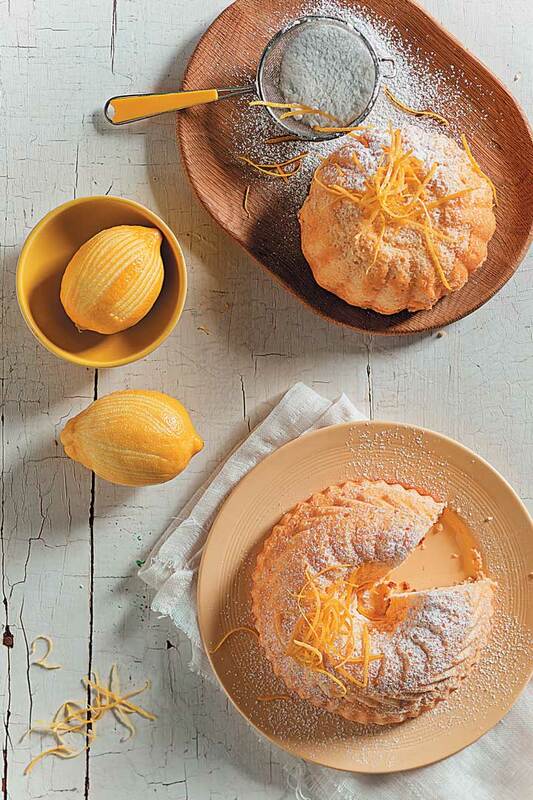 Serve dusted with icing sugar and sprinkled with lemon rind.